Drake University will mark the 50th anniversary of Tinker v. Des Moines, the landmark U.S. Supreme Court case that established the free speech rights of students in public schools. “Stand Up, Speak Up! Tinker v. Des Moines Turns 50” will be held on Wednesday, Feb. 27 at 7 p.m. in the Cowles Library Reading Room. 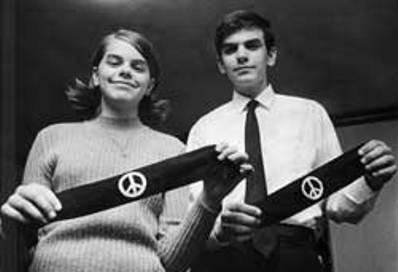 Mary Beth and John Tinker, plaintiffs in the case, along with Drake students, will lead a conversation on the values and challenges of freedom of expression. The event is co-sponsored by the Drake School of Journalism and Mass Communication, the Drake Law School, Cowles Library, the Drake School of Education and the Drake Department of Political Science. Contact SJMC Dean Kathleen Richardson (kathleen.richardson@drake.edu) for more information. Randy Minkoff, JO’71, was on campus this weekend to celebrate the 50th anniversary of the men’s basketball team’s Final Four appearance. 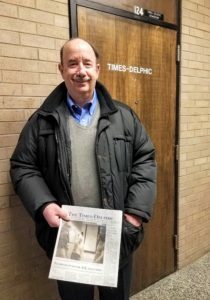 Randy was Times-Delphic sports editor during the year of the Final Four run. The following year he was editor-in-chief. Randy and his wife, Sue Castorino, own a business called The Speaking Specialists in the Chicago area. He also teaches at Loyola Chicago and Sue teaches at Northwestern. Drake students took home 21 awards in the Iowa College Media Association contest last week. Congratulations to all the winners! Applications are being accepted for the 2019-20 Meredith Apprenticeship Program. An information meeting will be held Wednesday, Feb. 13 at 7 p.m. in Mer. 104. Meredith Corp. offers six editorial positions for journalism majors, two design positions for graphic designers, and slots for a web developer and a data analyst. Apprentices commit to working 15-20 hours a week for the academic year. The jobs earn $10/hour and receive academic credit. Eligible students are juniors or seniors at the time of the apprenticeship. Magazine students must have completed or be enrolled in JMC 91 and/or JMC 70. Design students must have completed or be enrolled in Art 51 and 52. Send application materials by pdfs to Jeff.Inman@drake.edu by 5 p.m. on Friday, Feb. 22. Include a cover letter addressed to “Meredith Supervisors,” a resume, and five relevant work samples. In addition, applications for next year’s Meredith scholarships for magazine majors are available outside Mer. 119. A Drake news release honoring the accomplishments of six black alumni featured two SJMC alums. Crystal (Nance) Everett, JO’10, credits her experiences at Drake with leading her to a career in student services and higher education. Johnny Taylor, JO’91, received graduate degrees in communications and law from Drake and has gone on to a distinguished career in human resources management. Drake International offers opportunities for Drake graduates to work in China and Kosovo post-graduation. See www.drake.edu/workingworldwide for more information or connect at workingworldwide@drake.edu. Drake’s Speaking Center in Cowles Library opens today. Students can book appointments online to see a tutor for help in preparing, composing, and delivering speeches and presentations. Students, faculty, and staff members can also reserve the Speaking Studio to practice and record presentations alone or in small groups. Location and Hours: The Speaking Center is located in Room 18 of Cowles Library on the lower floor. A Appointments are available 10 a.m.-10 p.m., Monday-Friday. Drop in sessions are offered when tutors are available. To make an appointment Visit http://library.drake.edu/speaking to schedule a personal meeting with a tutor. The Drake University Career Fair will be held on Thursday, Feb. 14, 3-6 p.m. in Parents Hall, Olmsted Center. Graduating seniors only are scheduled from 3-3:30 p.m.; all students are welcome from 3:30-6 p.m. All majors are welcome to attend. Bring your resume, business cards and network with companies seeking interns and/or full-time candidates. Professional attire is required. To research the companies attending the fair, log into Handshake (my.drake.edu, click on Handshake icon under Campus Resources, use single sign-on feature to log in). Select Events, then click on Drake University Spring 2019 Career Fair. Click on View all Employers. You do not need to RSVP to attend. The Innovation Studio (124C Meredith) will be hosting several events during National Entrepreneurship Week, Feb. 18–21. Learn about large scale 3D printing and prototyping with Brandon Hart of HartSmart products. Create something on one of the vinyl cutters with Professor Chris Snider. You can learn about how you can create and make stuff at Drake during open maker days. For more information, email innovation@drake.edu.